Looking for a unique way to celebrate St George's day this year? Look no further! 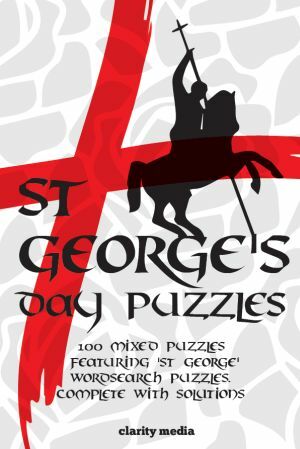 Now available is the brilliant book of 100 mixed puzzles, personalised to this special day with 'ST GEORGE' word search puzzles! If you know someone who is a puzzle fan and also enjoys celebrating the English national day, then this puzzle book could be a great gift idea. St George's Day is on the 23rd April, and is one of the four patron saint days of the UK and Ireland. The other saints days are St David's Day - which is the 1st of March (the patron saint of Wales). Perhaps the most famous of the saints days is St Patrick's Day, which is March 17th - he is the patron saint of Ireland and according to legend rid the country of snakes. The last one in the year is St Andrews Day - he is the patron saint of Scotland - and that isn't until November 30th. This book of 100 mixed puzzles includes an enjoyable range, that includes logic, number, word and maths puzzles so the whole range of puzzle types is well catered for. 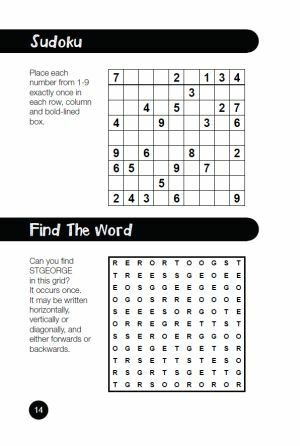 Specific puzzle types include classics such as sudoku, battleships, word wheels and many more: so this is the perfect gift for friends, family or just a treat for yourself this St George's Day.